Devanampiyatissa’s proclamation that he was the King of Sri Lanka and his efforts to force the people of the country to accept Buddhism sowed the seeds of Tamil consciousness. Till the crowning of Devanampiyatissa Tamil chieftains of the north, east and other parts of the country never faced any interference from Anuradhapura rulers. Ellala’s rule helped transform the Sinhala people into a nation and Sinhala consciousness into Sinhala nationalism. This transformation took place through Dutthagamani’s 14-year war to win back the Anuradhapura Kingdom. Though Vijaya never intended his arrival in Sri Lanka 2553 years ago (from 2010) laid the foundation for the racial conflict, the stories the Mahavamsa built around his arrival are still influencing the thinking and actions of the majority of the Sinhala people. Mahavamsa has four stories connected to Buddha’s arrival. Firstly, he stepped on the reddish soil of the northwestern coast of the island on the very day Buddha passed away. Secondly, Buddha had sought the help of Vishnu through Indra to ensure the safe passage and protection of Vijaya. Thirdly, Vishnu directed Vijaya to Sri Lanka in keeping with Buddha’s wishes. Fourthly, when Vijaya arrived, Sri Lanka was an uninhabited land. These stories form the bedrock of the Sinhala belief that Sri Lanka belongs to them and should be preserved as a Sinhala- Buddhist state. The first three stories provide the Buddhist connection and the fourth the basis for the claim that the Sinhalese were the first human settlers. This set of beliefs still governs the thinking of the Sinhala people. Facts, as stated in the previous chapter, are different. 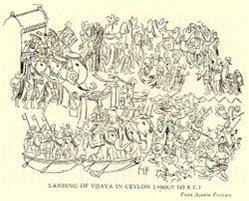 Sri Lanka was inhabited when Vijaya arrived in 543 B.C. Human settlements had been there for at least 125,000 years. When Vijaya landed in Tambapanni, a port on the southern part of the mouth of Aruvi Aru (Malwatta Oya), the area was ruled by the Yakkha tribe. Yakkhas ruled the western and southern portions of the island while the Nagas ruled certain areas in the western portion and the north. Tambapanni, a flourishing exchange port, was on the route Indian traders used regularly. Vijaya was a prince from Vanga (now West Bengal) who was expelled by his father, Sinhabahu the king, with his group of 700 youngsters for evil acts. They were put into boats and sent away. Vijaya was the elder of the twins to which his mother, Sinhasivali, gave birth. The younger boy was Sumitta. Sinhabahu was the founder of the kingdom centered on the city of Singapura and his descendents came to be known as Sinhalese. In keeping with the tradition of olden days the lion story might have been spun around his birth and youth of Sinhabahu to make him the descendent of some supernatural occurrence. The Sinha association might have been due to the meaning of his name 'lion-armed'. Sinhabahu was from the Aryan race. Whatever the origin of the Sinhala race it is sufficient for our purpose that Vijaya and his 700 men were the first group of Aryans to enter Sri Lanka. Vijaya kissed the soil and planted the Lion Flag. He then met Yakkha princes Kuveni, conquered the Yakkhas, became their chieftain, married Kuveni who bore him two children, Deegahatta the son and Visala, the daughter. Vijaya deserted her and the children and married a Tamil princes, daughter of the Pandyan king. Vijaya then consecrated himself as the ruler. He died in 505 BC. This in essence is the story Mahavamsa tells about the arrival, marriages and the consecration of Vijaya. When he had thus obtained many maidens and had given compensation to their families, he sent his daughter, bedecked with all her ornaments, and all that was needful for the journey, and all the maidens whom he had fitted out, according to their rank, elephants withal and horses and wagons worthy of a king and craftsmen and a thousand families of the eighteen guilds, entrusted with a letter to the conqueror Vijaya. All this multitude of men disembarked at Mahatittha, for that very reason is that landing place known as Mahatittha. The Pandyan sent out his own maiden daughter with 699 maidens chosen from among his nobility. These 700 ladies landed with their retinue safely at Cottiar. The princess was attended by a personal staff of 18 officers of state, 75 menial servants (being housekeepers, elephant keepers and charioteers) besides numerous slaves. It may reasonably be assumed that each of these 18 officers was accompanied by his wife and children, his men-servants and maidservants, male slaves and female slaves. In like manner each of the 699 noble maidens was accompanied by attendants, servants and slaves. And there were also numbers of families of each of the five sorts of tradesmen who came to Ceylon on this occasion. Mahavamsa says that the princess was from the Pandyan capital “Dakshina Madura” which means southern Madura. Most of the modern Sinhala scholars have interpreted that to mean the city of Madurai in Tamil Nadu. Mahavamsa adds that following the arrival of the Pandyan princess the ministers in full assembly consecrated Vijaya as the king. Vijaya died in 505 BC after ruling Tambapanni for 38 years. He had no children able to inherit. He desired that his brother Sumitta should succeed him. Honouring his wish ministers invited Sumitta who was the ruler in Sinhapura. Sumitta sent his son Panduvasdeva and 32 others. They sailed along the trade route between Vanga and Sri Lanka and landed in the eastern port of Gokanna. Vijaya’s chief minister Upatissa who ruled Tambapanni as regent from Uppatissagama for one year till Panduvasdeva arrived handed over the chieftaincy to him in 504 BC. Panduvasdeva ruled from Upatissagama for 30 years. This in brief, is the account given by Mahavamsa about the social formation of the Sinhala people. Mahavamsa speaks of no other population input from Vanga or from any other part of North India. It then speaks only about the absorption of Yakkhas and Nagas into the Sinhala social group. The process of absorption was initiated by Vijaya. He incorporated the Yakkhas into his administrative and military structures. Mahavamsa has reference to the existence of Yakkha settlements outside Tambapanni. Researchers say that the Yakkha tribe was gradually absorbed into the Sinhala race during the next few centuries. Abhaya, the eldest son, succeeded Panduvasdeva in 474 BC. His younger brother Tissa overthrew him after 20 years in 454 BC and ruled for 17 years. Tissa’s nephew and Panduvasudeva’s grandson Pandukabhaya captured power in 437 BC with the help of Yakkha chieftains and ruled for 60 years. He shifted the capital of his principality to Anuradhapura which according to archaeological evidence was developing as a settlement since 900BC. Pandukabhaya ensured the safety of his principality with the help of Yakkha chieftains. He appointed them as guardians for the three sides of Anuradhapura. The fourth side was the cemetery. During his rule Yakkhas formed the majority of the population of Anuradhapura. Pandukabhaya died in 367 BC and there was no notable change until Devanampiyatissa became the ruler in 307 BC. Devanampiyatissa’s regime brought about a marked change in the lives of the Sinhala people and in the structure of their ruling body. He consolidated his position by expanding the territory under his control by annexing the neighbouring chieftaincies. His brother Uttya conquered Kalyani, the Naga chieftaincy in the western coast. Another brother Mahanaga conquered the minor chieftaincies in Ruhuna. Following these annexations Nagas of Kalyani and Yakkhas of Ruhuna were absorbed into the evolving Sinhala race. Devanampiyatissa was instrumental for the introduction of Buddhism. He, a contemporary of the Mauryan Emperor Asoka, forged links with him soon after he became the ruler. He invited Asoka to send a missionary to convert him and his people to Buddhism. Asoka who was actively involved in the propagation of Buddhism sent Mahinda with the group of Buddhist monks to Sri Lanka. Mahinda met Devanampiyatissa in Mihintala and converted him to Buddhism which resulted in the introduction of Buddhism to Sri Lanka. Devanampiyatissa converted his family and his people to Buddhism, founded the Buddhist Sangha, Mahavihara, built Thuparama Stupa and Isurumuniya Rock Temple and engaged himself in Buddhist missionary work. Introduction of Buddhism and trade would have brought some Aryans to Sri Lanka but their numbers would have been small. On the other hand Tamil input might have been greater. Devanampiyatissa consolidated his regime by crowning himself in the Indian style as the Maharajah of Sri Lanka. He obtained Asoka’s blessing and support. Asoka sent his royal insignia to signify his consent. Asoka’s acceptance helped Devanampiyatissa to proclaim himself as the overlord of Sri Lanka. Though Mahavamsa claimed that Devanampiyatissa was the ruler of the entire country and that the whole of Sri Lanka had adopted Buddhism the reality was different. Most of the chieftaincies of the south, east and Vanni ignored his claim. But the chieftain who ruled Nagadeepa had accepted his overlordship. Devanampiyatissa consecrated himself as the first king of Sri Lanka and established the first kingdom. 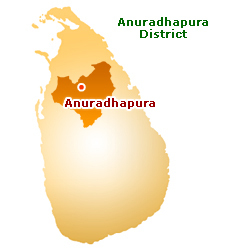 Anuradhapura which had remained a principality till then was converted into a Kingdom. Sinhalese thus formed a state for themselves. 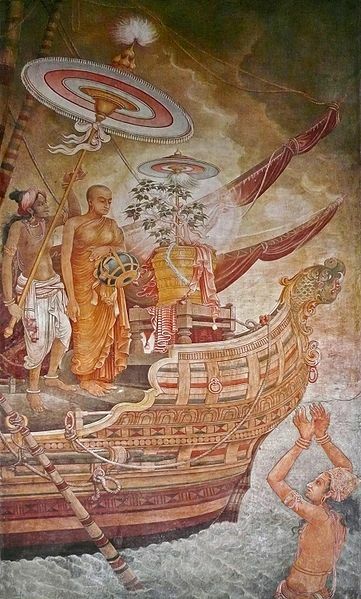 Sangamitta landing with the sapling of the Bodhi tree. Encouraged by the active support he had so far received, Devanampiyatissa requested Asoka to send a branch of the Bo-tree under which Buddha attained Enlightenment along with Bhikkunis to inaugurate a monastic order for women. Asoka sent Sangamitta with a Bo-tree sapling. Sanghamitta landed at Sambalturai (Jambukola), one of the ancient ports in the Jaffna peninsula, and was received by Devanampiyatissa’s emissaries who took chariots to transport her. This was the first instance the emerging Sinhala state interfered in the affairs of the Naga chieftaincy of Jaffna. Devanampiyatissa sent emissaries to the chieftains in the north, east and the south to accept him as their overload. Chieftain of Nagadeepa accepted his claim, helped him to receive Sangamitta and permitted him to build Shamutha Pannai Shala Mandaba (hall) and Jambukola Vihara near the spot she landed. The chieftains from Vanni, Trincomalee, Batticaloa and Kadiragama refused to accept Devanampiyatissa as their overlord and resisted his effort to impose Buddhism on them and their people. Sanghamitta planted the sapling of the Bo-tree at Anuradhapura and started the Bhikkuni order. Mihintala where Mahinda converted Devanampiyatissa to Buddhism and the Bo-tree that Sanghamitta planted at Anuradhapura are part of Sinhala- Buddhist heritage and consciousness. The seeds of Tamil consciousness Devanampiyatissa sowed sprouted soon after his death in 267 BC. It provided the environment for revolt by the Tamil chieftains. After his death his brothers, Uttiya, Mahasiva and Suratissa took turns in that order and ruled Anuradhapura for ten years each. But they could not maintain the vast kingdom Devanampiyatissa had established because they lacked the authority and charisma of their brother and because the necessary military and administrative infrastructure had not been built. Sinhala- Tamil rivalry began in 177 BC during the reign of Suratissa. Two Tamils, Sena and Guttika, defeated Suratissa in battle and conquered Anuradhapura and ruled it for 22 years. Anuradhapura was under Tamil threat for the next 149 years ending in 88 BC. Eight Tamil kings ruled Anuradhapura for a total of 82 years during that period. Mahavamsa calls them invaders from Tamil Nadu but Tamil historians and scholars feel that they were Tamil chieftains from Vanni who rebelled against the imposition of Buddhism. Their search of the records in Tamil Nadu for any reference to any invasion from Tamil Nadu during that period was not fruitful. Recent research done in Poonari has thrown new light. Pushparatnam, Professoor and Head of the Department of History and Archaeology, University of Jaffna, discovered in Poonari ruins of buildings resembling a palace and two pieces of earthenware with Brahmi inscriptions which indicate the existence of an ancient chieftaincy in that area. He postulates that that chieftaincy might have been the precursor of the Kingdom of Jaffna. Kunarasa speculates whether Sena and Gutika were the chieftains from that chieftaincy. Mahavamsa says that Sena and Gutika were horse dealers from Tamil Nadu. The fact that they ruled Anuradhapura for 22 years seems to suggest that they commanded a huge army. Asela, one of the sons of Suratissa’s elder brother Mahasiva, defeated the Tamil kings after a lot of preparation and an intense battle. Asela ruled Anuradhapura for only ten years. He was defeated by another Tamil, Ellala who ruled Anuradhapura for 44 years, 145 BC- 101 BC. His was the second Tamil rule of Anuradhapura. Mahavamsa says that Ellala was a Chola prince who had brought a big army. It says he attacked the Anuradhapura kingdom from several directions and captured the city. He was a Hindu. Mahavamsa says that he was a man of ‘false’ beliefs, but it says that he was a just ruler. It adds that he did not give Buddhism the same support given by earlier rulers and charged that he neglected agriculture and irrigation. Though Mahavamsa says that Ellala was a Chola Prince a folk drama popular among the Tamils Ellalan Koothu says that he was the son of Sena, one of the first Tamil rulers of Anuradhapura. From this and from the fact that Ellala evinced interest in the development of the agriculture of Vanni, Tamil scholars suggest that he was also from the ancient chieftaincy of Poonari. Ellala built Vaunikulam which is north of Anuradhapura. Dutthagamani was the grandson of Mahanaga, a brother of Devanampiyatissa, who ruled the chieftaincy of Magama in Ruhuna and the son of Kavantissa and Viharamadevi. Kavantissa, who succeeded Mahanaga, consolidated his rule by defeating the minor rulers of the south but was reluctant to take on Ellala. But Dutthagamani was determined to restore the rule of their dynasty at Anuradhapura. He raised a large army, motivated his soldiers drumming into their minds a sense of Sinhala patriotism and led them to battle. He succeeded in fulfilling his ambition after a 14- year military campaign. He defeated Ellala in duel in 161 BC and ruled Anuradhapura for 24 years. Dutthagamani main achievement was to unite the Sinhala people and to bring most of the areas of the south under his rule rather than ending the Tamil threat to Anuradhapura. Thirty-three years after his death, Tamils conquered Anuradhapura again and ruled it for 12 years. Succession disputes weakened Anuradhapura after Dutthagamani death. Though Dutthagamani had a son, Saliva, his brother Saddhatissa succeeded him. Saddhatissa’s younger son, Thulathana, who succeeded him was killed within a month by his eldest brother Lanjatissa who reigned for nine years. Lanjatissa’s younger brother Khallatanaga was the next king He ruled for five years. Then Saddhatissa’s youngest son Walagam Bahu I ascended the throne in 104 BC. He was overthrown by a group of seven Tamil chieftains in the same year and five of them took turn and ruled Anuradhapura. Walagam Bahu I who fled to Ruhuna returned with a huge army and recaptured Anuradhapura in 88 BC. The constant threat the Tamils posed to Anuradhapura during this period promoted Sinhala unity and nationalism and ingrained in their psyche a sense of threat. The Sinhalese people developed the fear that the Tamils would destroy them- their race, religion, language and civilization. Sinhalese have inherited that fear perception. During the period of the Lambakanna dynasty, 67 AD- 428 AD, the Jaffna peninsula was under the rule of the Anuradhapura kingdom. Vasabha, the founder of the dynasty brought most of the country including the Jaffna peninsula under his authority. That situation continued until the end of the period of the dynasty. Mahallakanaga, the fourth king of that dynasty, built the Salipapatha Vihara in the Jaffna peninsula. The sixth king Kanittha Tissa renovated a shrine and the tenth king Yoharikka Tissa constructed a wall around Tissa Vihara. Two factors helped the spread of the Sinhala Buddhist influence to Jaffna during this period. Buddhism had become the popular religion in Tamil Nadu. Northern Province too had turned Buddhist. Buddhism thus served as a common vehicle of unity and accommodation. The other was that the Tamil chieftains who ruled Nagadeepa and the other chieftaincies of the north were weak and support from Tamil Nadu was not available. The period between the 2nd Century and the 6th Century was a Dark Period of Tamil Nadu. It fell under the rule of Kalabhras who overthrew the established Tamil kings and some of the ruling families migrated northwards and founded enclaves for themselves away from the Kalabhras. Buddhism and Jainism grew deep roots in the society. Kalabhra rule had its impact in Jaffna too. Kantarodai, which had developed as the main principality of the Jaffna peninsula (See the next chapter) too adopted Buddhism and emerged as the centre of Tamil Buddhism in Sri Lanka. Tamil researchers say that the archaeological evidence discovered in Kantarodai should be viewed in the context of the developments in Tamil Nadu and not in the context of the events in Southern Sri Lanka. The decline of the Kalabharas began in early part of the 5th Century and the traditional Tamil kingdoms, Pandyas, Cholas and Cheras, reasserted their power. At the time the power of the Pandyan Kingdom grew there was disarray in Anuradhapura. A struggle for succession that followed the death of Mahanama in 428 AD brought three rulers in the next two years and using this unsettled state of affairs, Pandu, a Pandyan prince, invaded Sri Lanka and seized the throne in 429 AD. The struggle for succession was the result of an intrigue by Mahanama, who was a younger brother of King Upatissa II. Mahanama had a secret love affair with Uppatissa II’s consort, a Tamil. He conspired with her and got her to murder Uppatissa II. Mahanama succeeded Uppatissa II to the throne and made his brother’s consort, the Tamil, his queen. On Mahanama’s death, their son Suvatisena succeeded him. The Buddhist monks objected to his consecration saying that his mother was a Tamil. The opposition was led by Mahanama Thera, a learned and reputed Buddhist monk. He asked his cousin, Princess Samgha the daughter of Mahanama’s first wife, a Sinhalese, who was away in Bengal because she was married to a chieftain there, to return to Anuradhapura and claim the throne for her infant son Dhatusena. She contrived to have Suvantisena murdered but Laimintissa II was appointed the king. Princess Samgha got him deposed with the help of Kalabhresvara whom she appointed the regent. Mahanama Thera, an uncle of Dhatusena and his tutor was the man behind all these manipulations. Their scheme collapsed when Pandu, utilizing this unstable situation, invaded Anuradhapura, killed Kalabhresvera and seized the throne. Princess Samgha fled to Ruhuna with Dhatusena. Mahanama Thera inspired the 16-year campaign that followed to dislodge the Tamils and reestablish the Sinhala rule in Anuradhapura. Tamils ruled Anuradhapura till 455 AD, a period of 26 years before Dhatusena, a scion of the other powerful Sinhala clan, the Moriyas, recaptured the throne. The hold Anuradhapura had on outlying chieftaincies, especially in the north had weakened and Dhatusena had a massive task of consolidating Sinhala rule during the 18 years, 455 AD-473 AD, of his rule. His uncle Mahanama was Dathusena’s pillar of strength. His support enabled him to restore to Anuradhapura its preeminent position. Mahanama was also busy during this time compiling Mahawamsa. That contextual situation explains his bias in his otherwise excellent work. Through the two sets of stories mentioned earlier he motivated the Sinhalese to believe that Sri Lanka is their country and it should be preserved a Buddhist country. The two sets of stories woven around Buddha and Vijaya have become part of the Buddhist consciousness and have emerged as the pillars of Sinhala- Buddhist identity and nationalism. While Mahanama was whipping up Sinhala nationalism by portraying Tamils as invaders and foreigners and portraying Dhatusena’s 16-year struggle to push them out of Sri Lanka as a heroic act Dhatusena’s favourite son Moggallan fled to Tamil Nadu and returned with a huge Tamil army and defeated Kassapa in 491 AD. Kassapa was the eldest son of Dhatusena but his right to succession was disputed because his mother, a Pallava princes, was considered inferior. Moggallan was born to Dhatusena’s second wife, a Sinhalese princes. Thus, Dhatusena groomed his second son Mogallan as his successor. Angered, Kassapa killed his father and usurped the throne. Moggallan, frightened for his life, escaped to Tamil Nadu and returned with a powerful army, defeated Kassapa and ascended the throne. This Kassapa- Moggalan dispute plunged Anuradhapura into instability and introduced two new factors into Sinhalese history. The first was the intense rivalry between two dynasties, the Moriyas and the Lambakannas. The second was the introduction of the Tamil military into Sinhala royal family disputes. The dynastic dispute was intense and historians say that they fought to the bitter end. With Kassapa taking refuge in Sigiriya where he built the famous rock fort which turned out to be the storehouse of the fantastic Sigiriya frescoes, the hold of Anuradhapura over the outlying chieftaincies diminished. The chieftains of Ruhuna and northern and eastern parts of the country were not affected by the events happening in Anuradhapura and carried on on their own. In Anuradhapura, which was plagued by suicides and murders Silakala, reestablished in 518 AD the Lambakanna rule but Mahanaga brought again the Moriya dynasty to power in 569 AD. His immediate successors Aggabodhi I and Aggabodhi II managed to hold on to the Moriya rule but were unable to consolidate their power. Under Moggalana III Lambakannas overthrew the Sanghatissa II in 614 and the Moriya challenge to power petered out. Manawamma (684- 715) restored to Anuradhapura the predominant position it earlier enjoyed. Adds Nath Yogasundram in A Comprehensive History of Sri Lanka, p 78:, “There were Tamil ministers and, probably, even a prime minister. Potthakutthu was a Tamil minister who was powerful enough to place a puppet king named Datha in power after the death of Aggrabodhu IV in 683 AD. Potthakutthu continued to be the power behind the throne and when Datta died in 684 AD, he replaced him with another puppet king named Hatthadattha II. The latter only survived for six months before being put to death by Mavanamma (684-718 AD). Potthakutthu committed suicide by eating poisoned cakes on hearing of Hatthadattha’s death." The second Lambakanna dynasty that lasted until the Pandyan invasion of 853 AD brought stability and during that period of one and a half centuries, Anuradhapura reasserted its dominance countrywide. Ruhuna was totally subjugated and the northern chieftains acknowledged the Anuradhapura rulers of their overlords. Anuradhapura kings resumed their work of establishing Buddhism in the Jaffna peninsula. King Aggabodhi II (604-614 AD) converted the Unalomaha temple in Jaffna into Rajayathanathathu Vihara and donated an umbrella to the Amalathesia Chaitiya. Though no other literary or inscriptional evidence is available Buddhism was entrenched in some parts of the Jaffna peninsula.